It includes trigger and reset inputs, four in / outputs, and a common out / input. Each time a pulse is received at the trigger input socket, the common out / input is connected to the next in / output. After the fourth in / output, the next trigger makes it step back to the first again, and so on. A positive pulse at the reset input switches the out / input immediately back to the first in / output. Voltages in the range -12V...+12V at the O/I resp. 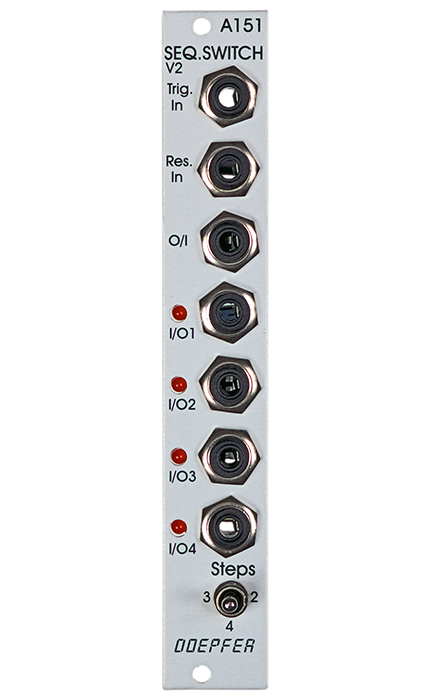 I/O sockets can be processed by the module.